Though it seems a little counterintuitive, considering that our upcoming RTW trip is obviously going to be expensive, our journey to deciding to take this trip ties in very closely with our growing interest in living simply and frugally. Ridiculous sounding, I know. But hear me out. As I briefly alluded to in the post where we announced our upcoming trip, our decision to sell our home and more than half our belongings, give away still more of our things, and walk away from our profitable jobs, did not actually start with a desire to travel (although, the desire to travel is sort of like breathing: it’s always there, we’re just not always consciously focusing on it). It started with the seemingly obvious conclusion to our quarter-life angst: the jobs that ran our lives were, at their core, us selling our time in order to buy other things–and we were buying all the wrong things. Then, one thing led to another, and boom, travel. Ever since we made the decision to be conscious of living more simply, we’ve found more and more moments that reaffirm it. 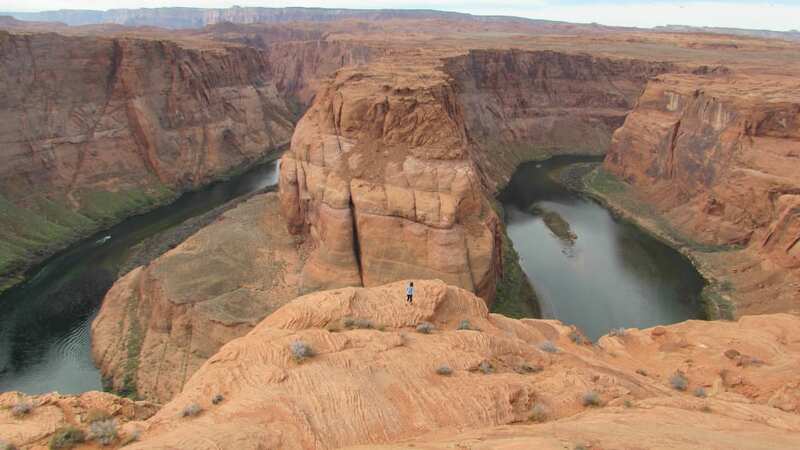 One that sticks out has always been the day we visited Horseshoe Bend in Page, AZ. We drove into Page when passing from the South Rim of the Grand Canyon to Zion National Park, with the plan to visit Antelope Canyon. It’s supposed to be remarkable, and I’m sure it is, but we had also set financial limitations on this road trip: we had our upcoming RTW trip to think about, not to mention our need to leave some money to the side to help us with our next steps when we got home. We drove to two different tour companies, and weren’t excited about either one: they were expensive (about $40/head), not leaving for another couple of hours, and if the people already milling around and waiting were any indication, it was going to be crowded. 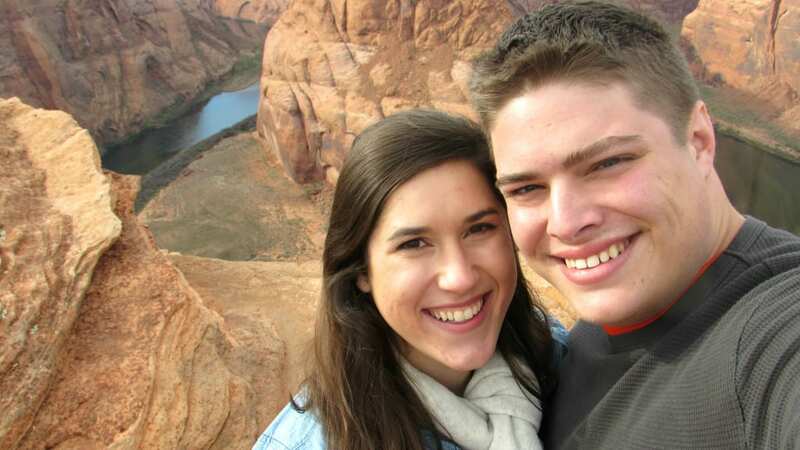 One day we’ll likely visit Antelope Canyon, but Jeremy and I looked at each other in that parking lot and knew: it wasn’t going to be that day. 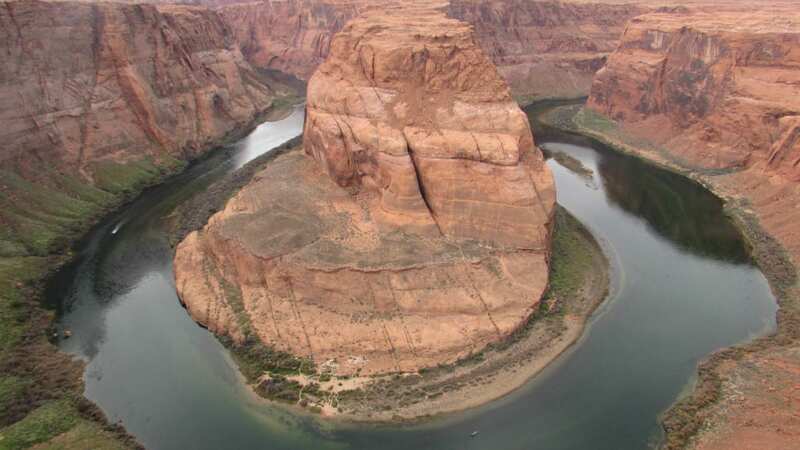 So, we set off across town, only to see a sign for Horseshoe Bend. We had heard of it, of course, and wanted to stop by, but when we were mapping out the route for this trip, we had thrown it out of our minds due to time limitations. Yet suddenly, we had some time back. 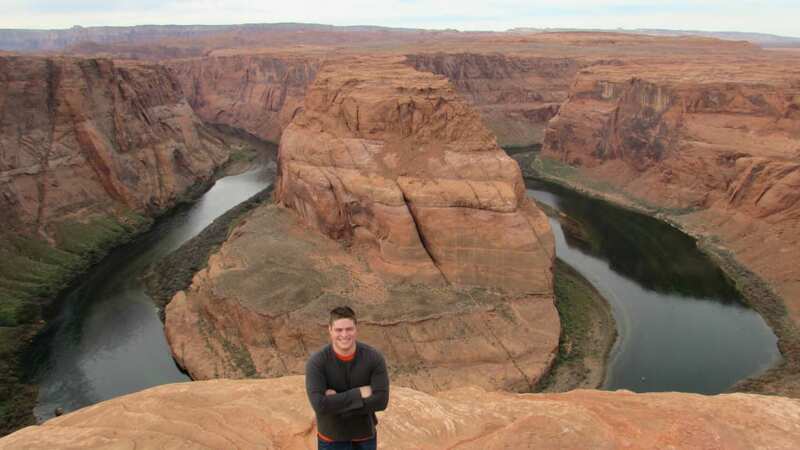 Horseshoe Bend was stunning. Absolutely gorgeous, with only about a dozen other people milling around once the group tour left a few minutes into our visit. The open space gave us room to breathe, the surrounding area had tons of rocks and plateaus that could be used as viewpoints and adult jungle gyms. And, it didn’t cost a penny outside the gas to drive there. This was our lunchtime view of the day. Not a McDonald’s, not a sit down restaurant: just us, some PBJ’s, fruit, homemade chocolate chip cookies, and the lazy Colorado River below us. We stayed far longer than we intended–taking photos, eating lunch, chatting about old memories and future dreams. There was a lot of laughing that afternoon. When we eventually made our way back to the car to leave Horseshoe Bend and head to Zion, we didn’t feel like we had missed anything by foregoing Antelope Canyon. 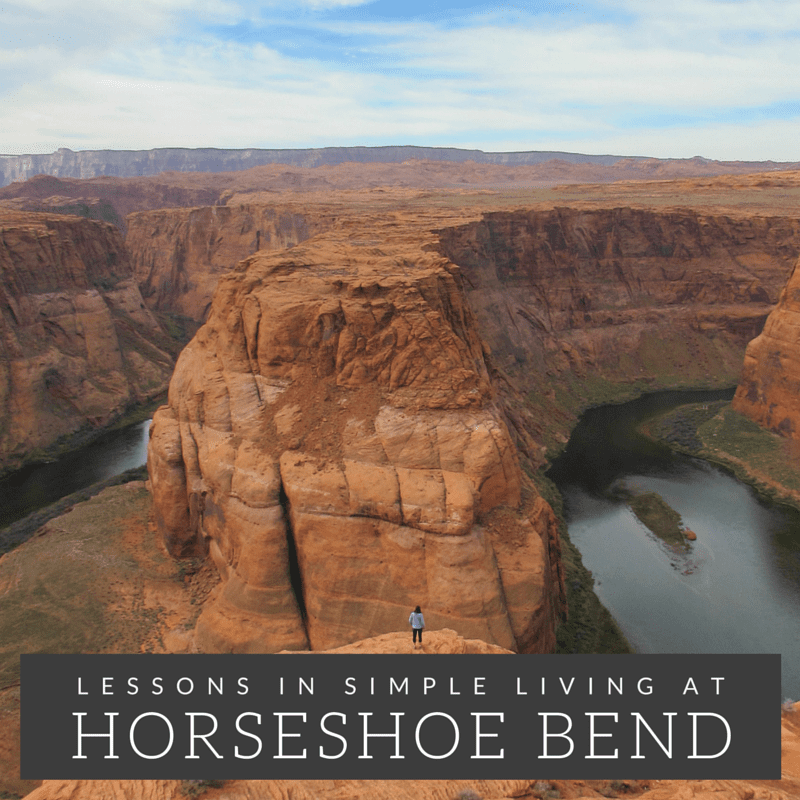 Using time always presents an opportunity cost: when you’re doing one thing, you’re obviously missing the chance to do something else–and we would not have wanted to miss our joyful and relaxed time at Horseshoe Bend. We passed that afternoon soaking in natural beauty for free instead of spending money to do a group tour, we ate lunch out of our cooler instead of stopping at a restaurant, and we are richer in more than just money for it. I need to do more travel in our great USA. This is a place I want to visit. Loved your post and I wish you luck in your upcoming trip RTW. Happy roving you all!!! !